The Mika Tyyskä interview is here! It’s time to enjoy the spellbinding sounds of an amazing musician who also happens to be an internet pioneer. 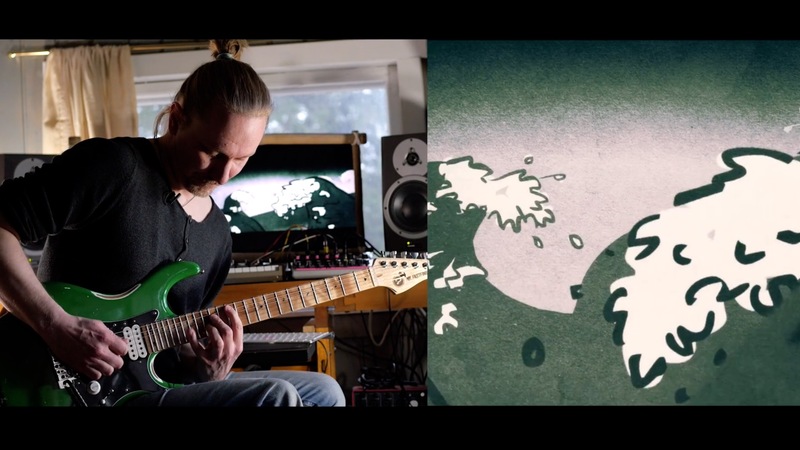 Mika Tyyskä is the creator of the Guitar Shred Show, an ingeniously inventive Flash animation that took the incipient guitar internet by storm over ten years ago. In the Shred Show, intrepid Web 2.0 surfers could use their keyboards to control a shredding avatar named Mr. Fastfinger. Armed with a battery of ’80s-inspired licks, the sensei-like Fastfinger waged musical warfare against an accordion playing demon who had possessed a horde of finger-tapping dwarves. The concept was clearly insane. The game’s cartoon sensibility and musical sophistication was instantly endearing. And thanks to some clever Flash h4x0ring, its surprisingly responsive controls made it addictive to play even with the more limited connection speeds of the day. Spiritually, the Shred Show was both cutting-edge and unabashedly nostalgic. It was filled with musical references to a golden age of heroes that had continued to inform guitar stardom even among those who were too young to have a wardrobe stocked with Spandex leggings. In other words, the Guitar Shred Show had all the ingredients of an internet phenomenon. And succeed it did, taking root in the nascent social media landscape during a fertile time after broadband but before YouTube. More importantly, it served as the launchpad of a musical career for the Finnish art student and polymath wizard who was its creator. In our interview with Mika, we talk about the origins of the Fastfinger project, and his musical evolution since that time. He graciously performs two of his awesomely lyrical compositions, Be Wind My Friend, and Effortless. In fact, Effortless is complete with the same synchronized visuals you’d see at a Fastfinger show. Mika also gives us a tour of the truly inspiring sounds on his pedalboard, affirming that his artistry extends to the brushes and colors he uses, and not just the subjects he paints. Our interview with the amazing Mike Tyyskä is ready to watch for Cracking the Code subscribers, right here on the Cracking the Code platform. I’ve seen Mika play in about the year 1990. They were two guys, the other one must have been his friend he mentions at 53:20. It was unreal. They were teens and they played better than any Finnish guitar hero we had ever heard. I’ve followed Mr. Fastfinger ever since the original Flash thing, but I still don’t know the name of the other guy. He had a scalloped Charvel and he was like water: shapeless, flowing, effortless. A natural guitar player, just like Mika said. Probably never! We’re moving to self hosted downloads that will hopefully no longer require the jump over to another web site. We’re still working on that but will probably have downloads of a user’s existing purchases working right from their account this week. Unclear when we will have new product downloads available working from our own site/store. If you’re interested in this one I would recommend a subscription anyway. Lots of new stuff to watch beyond this. Thanks @Troy. I’ll wait until the Joe Stump interview comes online then I will subscribe. I don’t want to subscribe now for say six months and then no Joe Stump interview. The Mika and Joe interviews are the two ones that I’ve been waiting on the most. Man this guy is so rad. I’ve never seen a Finn smile so much. He’s one of my favourite new(ish) discoveries right now. Hi Troy, I had the same question. Found the Mika interview under “Credits.” Thanks for the clarification. Well, that was fast! We just turned this on about ten minutes ago. So yes you can now access file downloads from your account under “Downloads”. It’s greatly simplified. Just click to download files immediately, with no journey to another web site. Previously you had to get a “credit” for something, then go over to Gumroad and “buy” the item for zero dollars. It was an annoying hack. So from now on, you can mostly ignore the “Credits” section. We don’t have dates on products. We’ll think about sorting these some way. But someone who buys a bunch of a la carte items right now doesn’t really care what date those items came out in the distant past, only when they bought them. If anything, a date reflecting when you got access to that item, like a purchase, but not actually a purchase, is probably what you’re looking for, and that’s… more complicated! Previous PostWhat is two-way pickslanting, and how does it work?